The University of Arizona Hillenbrand Memorial Softball Stadium reopened this Valentines Day. Although the opening game was cancelled due to rain, players, fans, coaches and more were all smiles to see the re-opening and ribbon cutting of the memorial stadium. 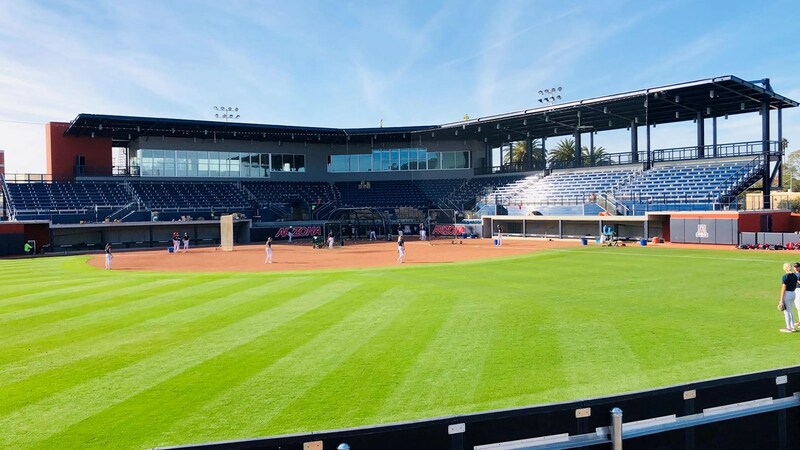 The new stadium, costing $8 million, is a state-of-the-art facility positioning the stadium as one of the best Softball stadiums in the country. Some highlights of the new structure include a shade structure that covers the majority of seats, upgraded restrooms and concessions, and enlarged visiting and home dugouts. Demolition of the previous structure and construction of the new structure began summer 2018. The construction team achieved completion of the stadium in 8 short months. During construction, the softball field was still accessible to the team to practice and prepare for their upcoming season. Congratulations to the design and construction team on this great project and completing in time for the 2019 softball season. General Contractor: Concord General Contracting, Inc.